Roybridge Image Library - Polly MacKintosh 1940 ? 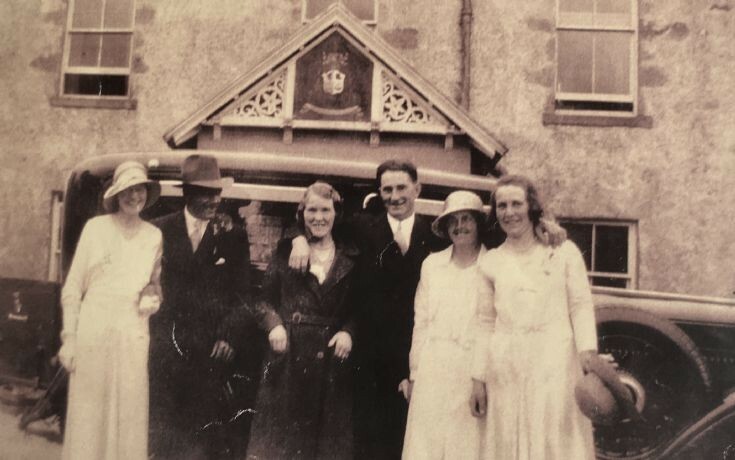 I was wondering if anyone remembers my mother Rosabel Don who spent many holidays with Polly and Sandy Macintosh at Bohuntin in the 30s/40s/50s....I had many happy times therewith my brother Charlie in the 60s. Mum is now 88 and has dementia but when I showed her some of the photos in your image library she chatted away about all those people as if it were today. Thank you for giving a little bit of light in the darkness of a horrible disease. Bella Brady and her husband Alec Maclaughlin on left. Joey Boyle on the right. I am absolutely amazed to find this photo of Mrs Polly MacKintosh , she was me and my brother Iain's foster mum with her husband Sandy. Iain and I lived with them in Bohuntine , I was with them from the age of 6 and my brother was 4. Iain went to Dumfries College when he was 12 and I went to Newmarket at the age of 15 and was an apprentice jockey before going to Holland to ride as a professional . To have seen this picture tonight has made me feel so emotional. Polly and Sandy also fostered Vincent Fisher , his sister Jean Hammill and Tommy and Cathie Rennie ,we were all there together and I still have contact with Vincent and Jean , sadly both Tommy and Cathie have passed away and sadly my brother Iain died from a heart attack 14 years ago while working in Bristol. I now live my retirement life at the age of 68 in the English Riviera down in Paignton South Devon. My goodness this photo has made me emotional ,but also so delighted to see my foster mum again after all these years. I do remember Rosabella Don , I was fostered by Polly and Sandy Mackintosh with my brother Iain , I also remember Charlie your brother Jane .